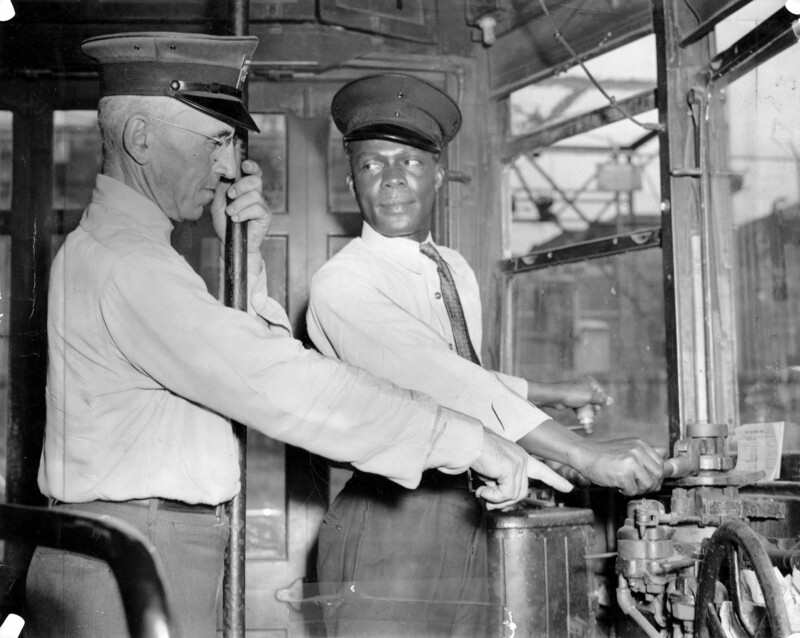 African American James Stewart, a former musician, receives instruction on how to operate a Philadelphia Transit Company trolley car, Philadelphia, PA, July 31, 1944. Flip to March protesting white trolley workers strike against black trolley operators, Philadelphia, PA., August 1944. After the Philadelphia Transit Company hired James Stewart and seven other African Americans as trolley operators, white PTC workers protested their upgrade by going out on strike on August 1. Unwilling to let a transit strike interfere with the production of war materials, President Roosevelt sent federal troops under Major General Philip Hayes to run the system. The strike ended within ten days, but exposed the racism that continued to haunt the nation, and that, in the words of a columnist in The Nation, "disgraced the United States in the eyes of the world."